attached is what i'm sending to dealer to install: Please excuse the 15 mins Power Point design just wanted to give tech some rough ideas. thought others complaining of terribly slow REAR fill/drain times would like it. yes there are other ways but seeming how i like to jam out and forget to turn pumps off i figured this was safest design. from my rough estimation this should help equal the fill/drain times with the center tank. i'm hopeful it will cut fill times to less than half due to less pressure on the pump. i'll take what i can get. i'm going to need custom WM bags and i've decided i'll keep the two hoses at front/back connected to hard tank so as i'm filling into sacs it will drain down into HDs until they are fill etc.. i feel this will keep water flow smoother than separating. let me know thoughts, figured this was the cheapest easiest way for now. Nice work but my head exploded trying to keep up. Love it. It should be a simple math problem for the engineers and design team to have all the ballast fill full, and empty in the same amount of time. There was a big improvement in 2019 for the 25LSV but they have room to improve. Keep us posted. oh come on its not that bad just a few extra pumps, wires and hoses! I would consider filling into the top of each sac. With an aerator pump, filling into the bottom will add some head pressure, slowing flow. Since you are going with an actual custom sac, just add an extra threaded port to the top, so you have 2. 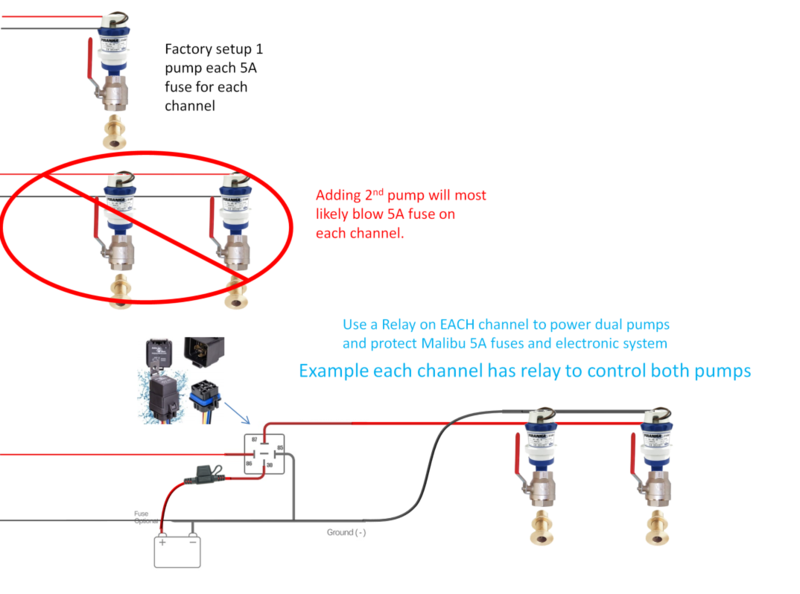 It would be an awful lot easier to add reversible pumps. I was thinking about adding a single reversible pump that made a T into the top of both sacks, then if that wasn't enough, adding a dedicated one to each sack. My only concern being if the drain would not work properly because of sucking air off the top. Do both drain lines have check valves? I'm thinking a 4" ball valve in the bottom of the boat, plumb it straight into the tank and add a 4" vent. Then you can just use the pumps to empty the tank/bag, it should fill in no time when you open the boat sinking valve. 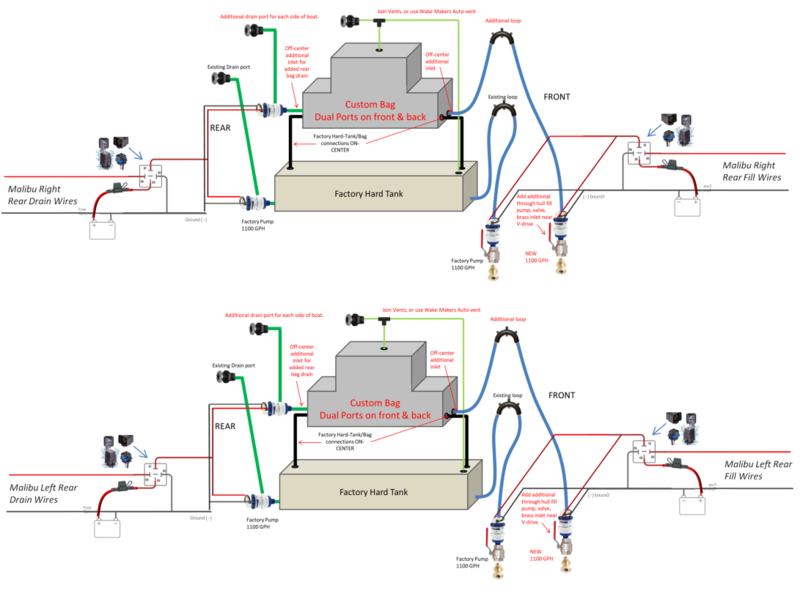 Less wiring, less hose, less worry about plumbing it to perform at its best. 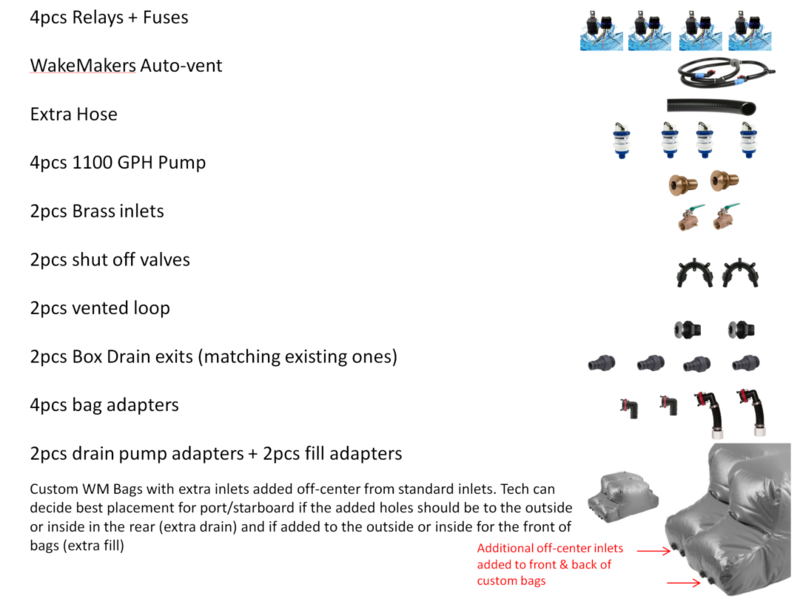 I would also be inclined to think that just adding a reversible pump would be the best thing. It would be so much easier. 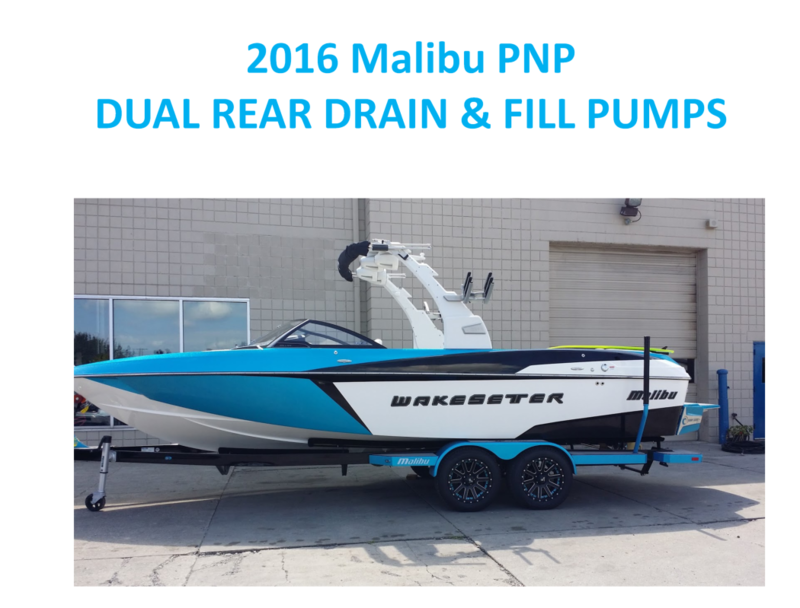 Get it all installed, take it out on the water, use a timer to find out the fill and empty times, program the timer, done. Newer reversible pumps also have a run-dry safety feature anyway. They’ll shut off before they get damaged. Edit: What he said. Ten Twenty One said it well. I did almost an identical upgrade on my last boat. If i had to do it again I'd try reversible. It was fast when done but there was just so many pieces and parts it was a bit of a mess. 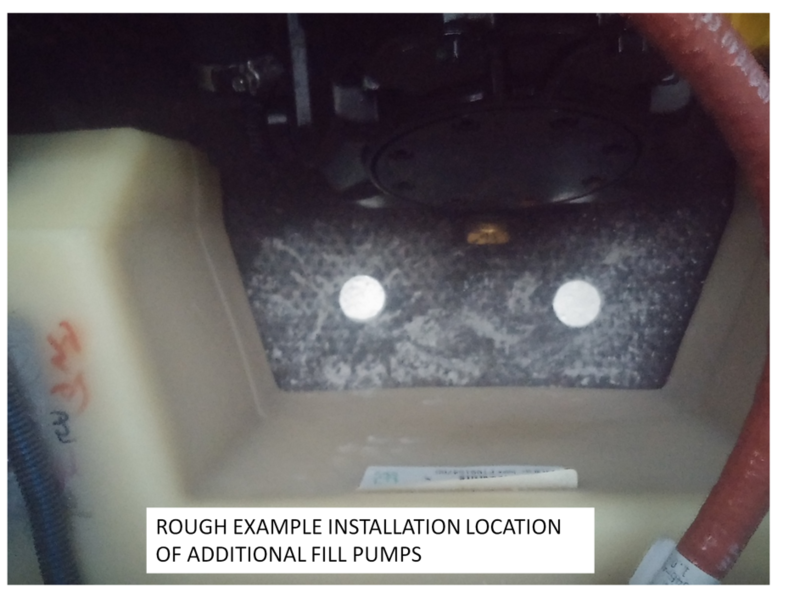 One thing to verify on thru hull inlet locations, make sure there is enough clearance to thread the pumps on/off. You need alot of space to spin the pumps and there is also a chance that when they are tight the outlet might end up pointing in a direction you did not plan for. I upgraded the factory pumps and when i tried to unthread them the pump outlet would hit the V-drive so I had to break them to get them off and add fittings to make get more clearance. Someone on here did a sweet install with reversibles neatley tucked in the rear of the boat and thats all I could think about while doing my upgrade. Less wiring﻿, less hose,﻿﻿﻿﻿ less worry ﻿about plumbin﻿g it to perform at its best. i guess i was slightly against reversible due to the damage factor and not knowing when they are empty and forgetting. If you are filling your piggy back bag at the same time you are filling your tank.... It will air lock the bottom tank... the bottom tank needs to vent until it is full or it will not fill.. this I know as it was a setup I had. No, keep your stock setup as is, and just add one reversible pump on each side. Connect it to the lowest port available (Prefferably the bottom of hard tank, if there is a port available). 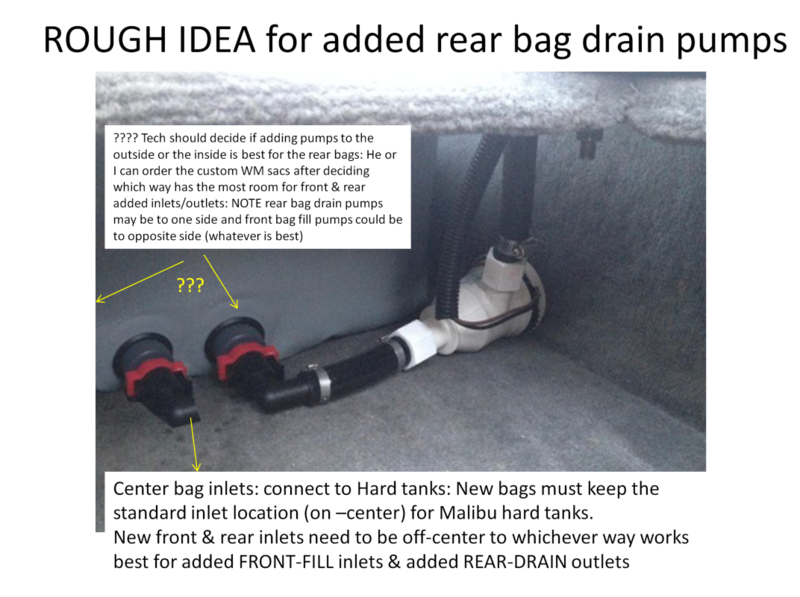 If there isn’t a port available low on the hard tank, you’d have to hook it up to one of the bottom ports on the bag. If you have to hook to the bag, it will help fill the whole setup faster, but when emptying, you’d have to set the timer to stop the reversible pump shortly after the bag is empty. Basically, your new fill times would be slightly longer than your new empty times. Although, with the L shaped tanks, you are more than 80% empty by the time the water level gets down to the bottom of the bags. You wouldn’t notice a huge difference, if using a bag port location. The jabsco timers are designed for use with a toggle switch, but you’d want to take the fill and empty signals from your pump wiring to trigger the timer module. This will make the initial programming a little more of a PITA, but then it won’t matter after it’s all set up. Then just install in the boat, put the boat in the water, program the timers for a longer time than you think you’d need, and run a stopwatch on the empty/fill. Then program the timers to that amount of time. I’d probably program it to 30 seconds less than actual, and just let the aerator pumps handle the last few seconds of fill, and empty. you’ll only need one pump for each side, and you don’t need to drill extra vents. 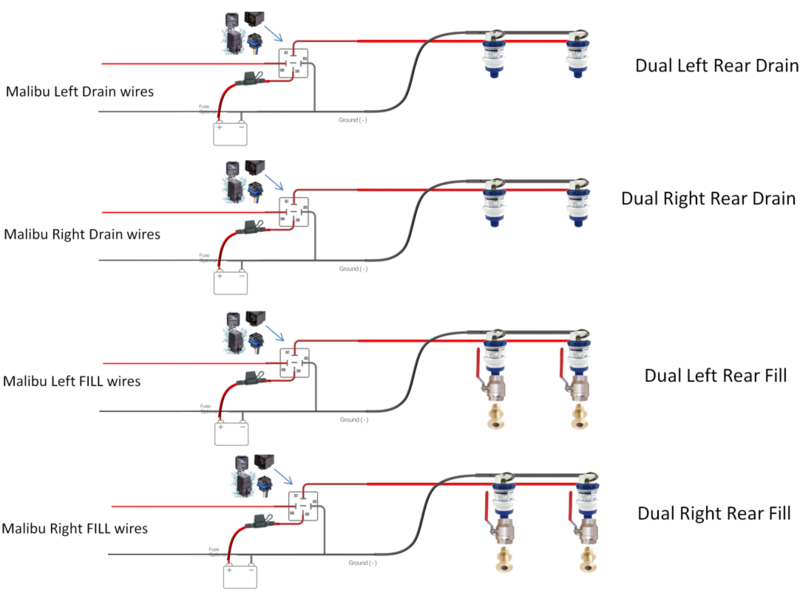 You’ll need one through-hull, with two connections on it, to feed both pumps. 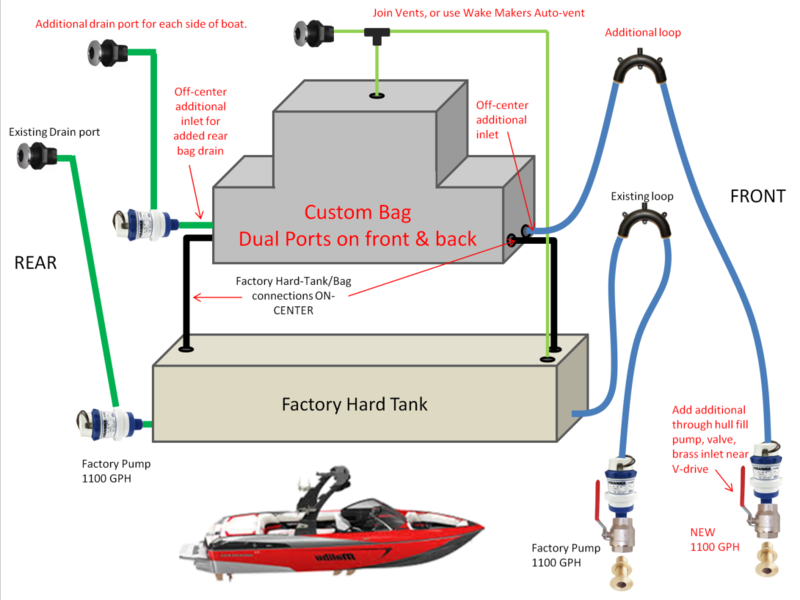 These new boats have a T’ed vent that serves the bag and tank, so that both can vent properly, no matter the water level, or what is being filled first. Also, they have L shaped tanks, so the top of the tank is much higher than the bottom of the bag, and also helps to eliminate the possibility of that happening. I don’t believe hulks boat has the L shaped tanks. Those were added to boats when they switched from the three piece to two piece hulls. Gotcha. I was thinking he got a new one for some reason. He should still be ok, as long as he has the T vent, so that they can vent independently.